Beginning in the early1880s Smith Cove was envisioned as an important transshipment site for railroads connecting the Seattle waterfront with its hinterlands. First the Seattle Lake Shore and Eastern Railroad built a long trestle at Smith Cove with a spur off of its main line that in 1887 reached Interbay from the SLSER depot at the foot of Columbia Street. 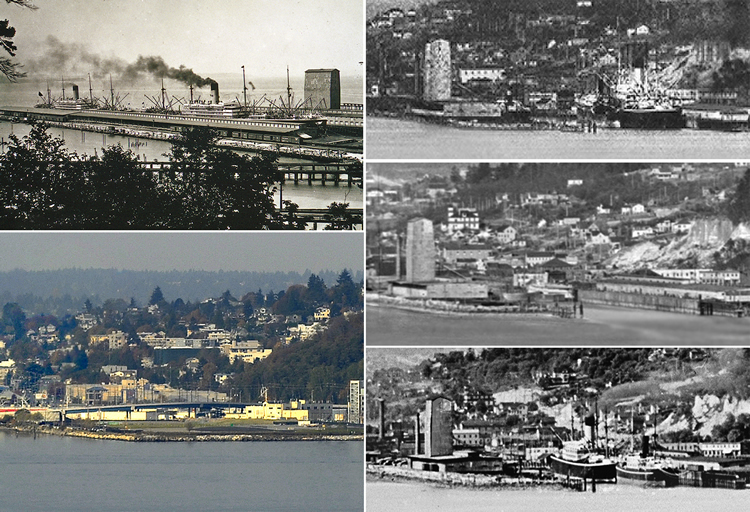 When the much larger transcontinental line, the Great Northern Railroad, reached Elliot Bay in 1893 a spur and wharf had been prepared for it at Smith Cove. The facility’s landmark elevator distinguished the pier well into the 20th Century, when the Port of Seattle became the principal operator at Smith Cove.